For the first time, a woman is set to lead Britain's Trades Union Congress. 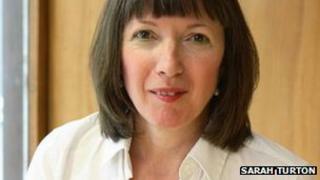 The TUC has confirmed that Frances O'Grady is to become its next general secretary, taking over from Brendan Barber at the end of the year. While she is little known outside the union movement, Ms O'Grady has "diplomacy, charm and imagination," former TUC leader Lord Monks said. "From early on, we identified her as a rising star," said Lord Monks, who was general secretary from 1993 to 2003. Frances O'Grady is not a household name. Her just-created profile on Wikipedia is very brief, but in trade union circles she is well known and highly regarded and some believe she is about to shake up the image of the trade union movement. She joined the TUC in the mid 1990s and soon caught the attention of the then general secretary, Lord Monks. "She's got diplomacy and charm, and imagination. She's got energy and dynamism and she's got the skills I believe that will make a very good general secretary," he said. She was born in Oxford in 1959, the youngest of five children. Her father was a shop steward at the British Leyland plant at Cowley. Her grandfather had been a founder member of the Irish Transport & General Workers Union. She has been the TUC deputy general secretary since 2003. After studying politics and modern history at Manchester University, she soon became involved in trade unions in her working life, first at the T&G, now part of Unite, then at the TUC. In 2003, she became the first woman deputy general secretary of the TUC. Kevin Maguire, associate editor at the Daily Mirror, has known Frances O'Grady since the 1980s. "She's very persuasive" he says. "She can sit people down and argue them into the ground." Colleagues say that she is also in touch with union members at the grass roots level and can speak for the growing numbers of women in low paid, insecure jobs. David Miliband recently shared a platform with her at a TUC youth unemployment seminar. "She knows that the modern world of employment has changed a lot, and she knows that trade unions have to be part of the solution to Britain's economic problems," he says. She also doesn't fit the traditional image of a trade union boss. "She'll now be the public face of trade unions," says Mr Maguire. "That will be a problem for [David] Cameron. He has a problem with women. She's quietly spoken... she could yet be his nemesis." Frances O'Grady takes on the role of general secretary at a time of growing industrial unrest. The TUC is organising a mass demonstration against the government's austerity measures in October. Several unions are warning of strikes in the weeks and months ahead. There are also fresh tensions between some unions and the Labour Party. "She will know that there will have to be an industrial strategy that will include strikes," says Mr Maguire. "But she is also aware that there has to be a political and public opinion strategy to win people over. "I suppose her critics will ask is she going to be strong enough to take unions through what is going to be a very difficult period."